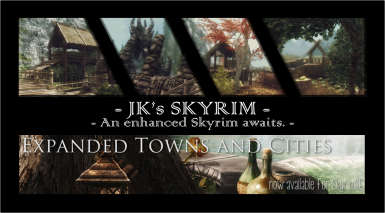 Compatibility patches for JK's Skyrim and Expanded Towns and Cities (ETaC). Includes a replacer .esp for JK's Skyrim removing conflicting villages of Dawnstar, Riverwood and Rorikstead. Patches have been created to work with this specific mod combination. The JK's Skyrim replacer .esp file is the work of JKrojmal and cannot be used without his permission. The patches I have created for this mod combination can be used freely. Thank you to JKrojmal and MissJennaBee for their permission to publish this file. Removes Dawnstar, Riverwood and Rorikstead from JK's Skyrim. I've always been a fan of ETaC even though I have helped Javier with JK's Skyrim for more than 4 years now. I like the approach Jenna takes to her towns and the mini quests and voiced NPCs that she includes. It would have been straightforward to patch the two mods but I didn't want to break the ambience and peaceful quality that her overhauls give to the villages. 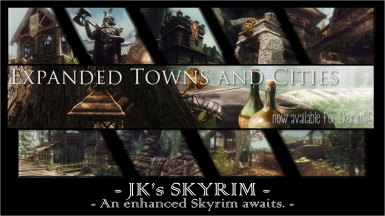 This mod is the alternative approach, removing the conflicting towns from JK's Skyrim to create space for the ETaC villages so the two mods can co-exist in harmony. To support this mod I've created patches to work with this specific mod combination. These patches combine patched elements of both overhauls into a single unified patch. You only need one patch so remember to disable / remove any redundant patches that have been replaced. Install JK's Skyrim and ETaC Complete from their respective mod pages. 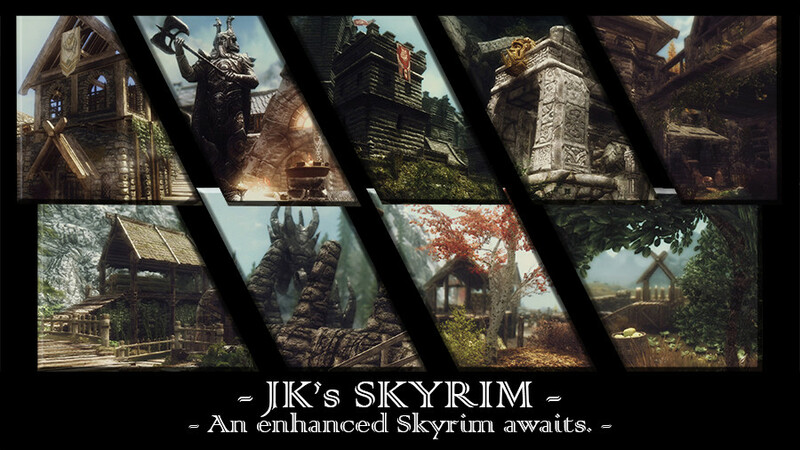 Download and install the JK's Skyrim replacer .esp from this mod page. Install the compatibility patches you need from this mod page. Be sure to disable any redundant compatibility patches you no longer require (refer notes below). The following patches have been made specifically to work with this mod combination. When using these patches you do not need the individual patches from the JK's Skyrim or ETaC mod pages. You only need one patch so be sure to disable any patches that you have already downloaded from JK's Skyrim or ETaC. All patches are .esp / ESL flagged files and won't take up a spot in your load order. Blowing in the Wind - removes any floating lanterns and adds blowing functionality to all JKS and ETaC lanterns and signs. Carriage and Ferry Travel Overhaul - fixes clipping in Dawnstar, Morthal and Ivarstead. Holidays - fixes clipping decorations and adds new decorations to the JKS and ETaC buildings and structures. No Snow Under The Roof - adds snowy roofs and pathways to Dawnstar, Winterhold and Morthal. Additional patches are also available for the JK's Skyrim + Dawn of Skyrim and now ETaC mod combination. Specific Blowing in the Wind and Holidays patches have been created for the trio of mods working together. Patches come after the mods they patch. If in doubt just use LOOT. If you are using MO2 make sure the JK's Skyrim replacer file is below the JK's Skyrim mod in the left pane.